National Fiber’s Cel-Pak is a premium, all borate cellulose insulation. 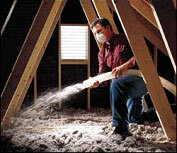 Cellulose insulation is blown-into your home by using two holes in every wall bay insuring each bay is 100% full. Increase the value of your new buildings and existing homes. Custom Insulation Company’s teams of insulation specialist will quickly and effectively handle your installation, on-time and done right. For more information or to have a Project Estimator contact you please call or email us at info@custominsulation.com.